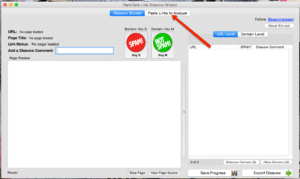 Build your Webmaster Tools disavow file the right way. 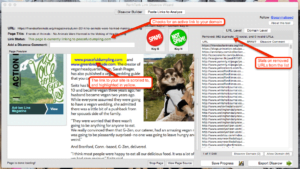 The free version for Windows and Mac OSX can take up to 200 pasted URLs. This is beta software, so let me know if you find any hiccups! Download the free desktop app for Windows and Mac OSX! 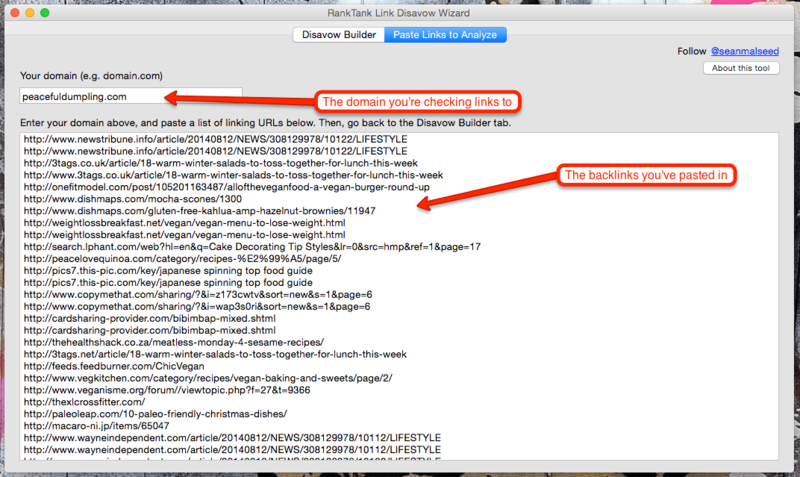 The Disavow Backlinks Wizard allows you to view each linking page and judge for yourself if it’s spam or now. 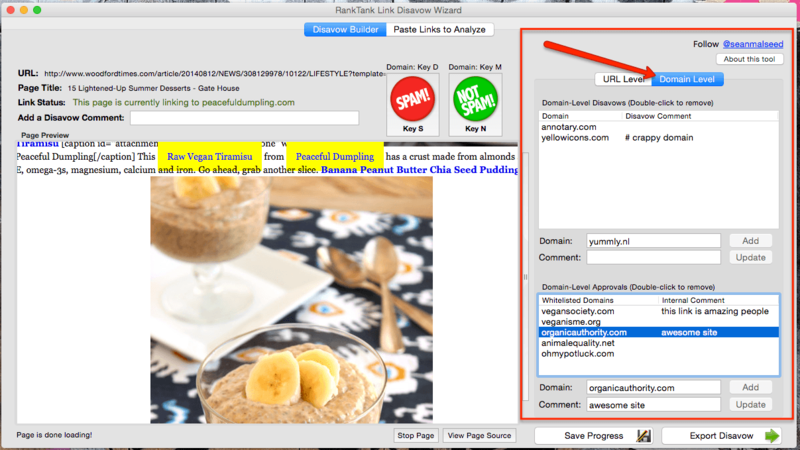 The preview pane backlinks tester automatically highlights the link to your site in yellow. Use your keyboard to SPAM the URL or entire domain, or approve either, and automatically pull up the next link in the list. Don’t rely on automated tools alone. There’s no replacement for your seasoned eye and common sense. The Link Disavow Wizard is a great compliment to backlink tools like Google Webmaster Tools exports, Majestic, SEMrush, Moz and more! 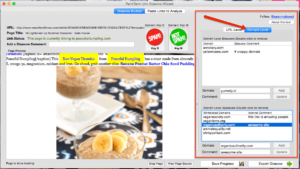 The free version is limited to pasted lists of up to 200 URLs. It’s only $15 to remove that limit! It’s pretty simple. 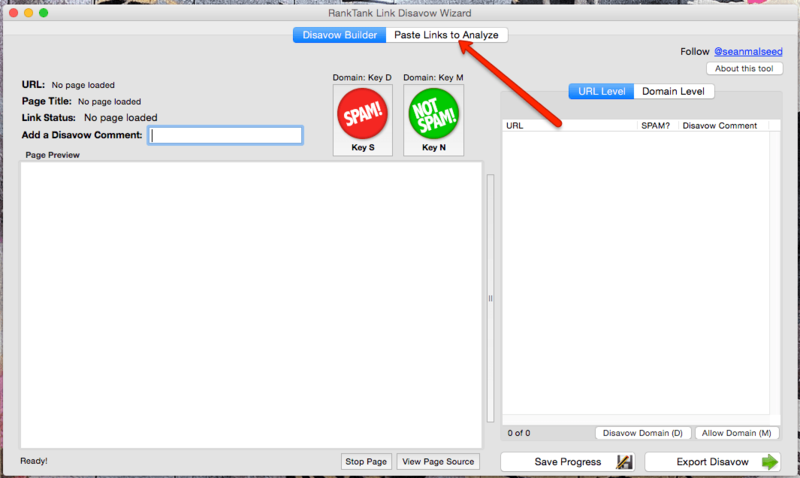 The RankTank Link Disavow Wizard is built to make checking backlinks manually a super-smooth and efficient process. You’re only going to need two things: a list of your backlinks, and your wits. You can export links to your site using Google Webmaster Tools. Here’s a great Google Support article on how to do that. You can also use a service like SEMrush or Majestic. Once you have your list, it’s super easy! 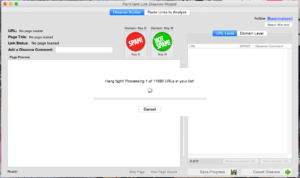 Let’s walk through using a list of URLs to verify and generate a disavow file using Link Disavow Wizard. The process is the same in both the Windows and the Mac OSX versions. When you first open the program, you’re going to see a bunch of big, blank spaces. Don’t worry about these yet. The first think you’re going to do is click the Paste Links to Analyze tab. Funny enough, this is where we’re going to paste the links we’re going to analyze! Once you’re in the Paste Links to Analyze tab, you enter your domain under the Your Domain heading formatted as yourdomain.com. 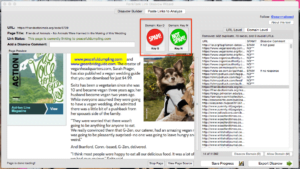 In the big area, paste your list of links! Then, click back to the Disavow Builder tab. The software will automatically parse the list for a bunch of stuff. The tool will now process your list. Depending on your computer’s speed, this can take a few minutes. We’re automatically removing duplicate URLs, social media URLs (Facebook, Twitter, Tumblr and more), and invalid URLs. 4. Look for the yellow links! 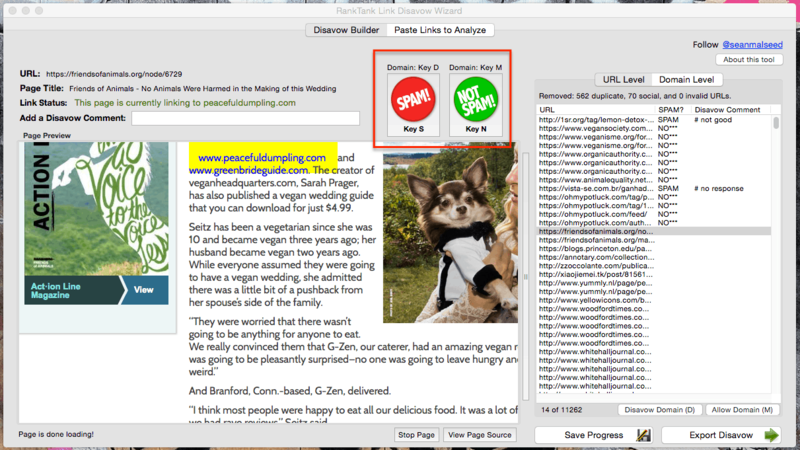 Once the parse is completed, the remaining URLs will be sorted by domain, and the first URL will automatically be queued up in the Page Preview pane on the left. 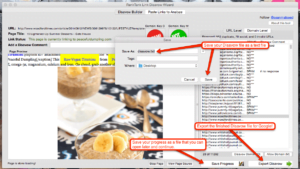 The software will automatically check the page for a link to your site. If the link is found, it will be highlighted in yellow in the preview, and automatically scrolled into view. 5. Time to start making choices! Keyboard control makes this fast and efficient. You can manage the domain-level disavows and approvals by clicking on the Domain Level tab. Comments on disavowed domains will be included in the disavow file for Google. Comments on approved domains are just for you and your team internally! 7. 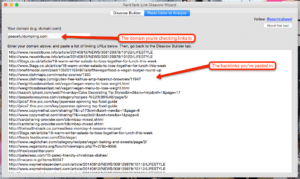 Export your finished disavow file! 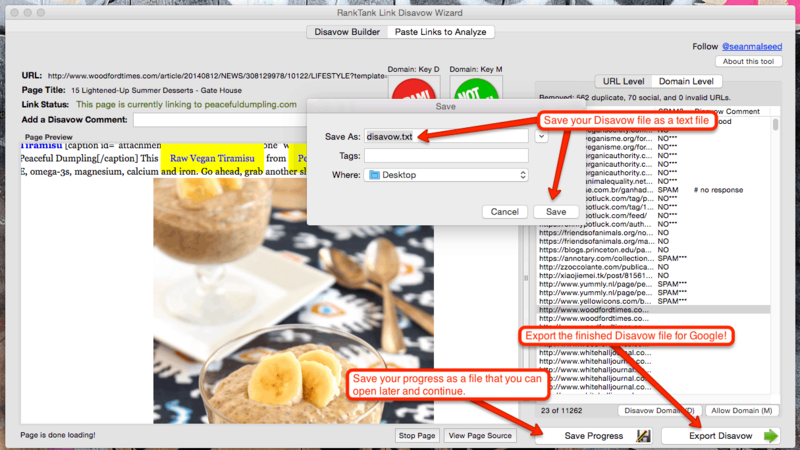 Once you’re finished, simply click Export Disavow to export a completed disavow file in text format, ready for Google! You can also click Save Progress to save your progress, which will save a file that you can open up in the software later. This really helps with huge disavow projects that will take more than one sitting! Anyone with RankTank Link Disavow Wizard can open your saved progress file, so send it along teammates to pick up where you left off! Get the full version for only $15! 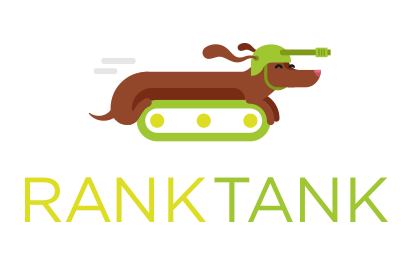 Help support the pizza habit of the RankTank and CircleRank teams, and get a great application too! I was hoping the tool would tell me what’s Spam and what’s not. How am I supposed to have ANY idea what Google thinks is spam? There are 80k sites linking to my site. I’m sure thousands of those links are worthless. Isn’t that Google’s job to figure out? I didn’t make those links. Other people did. F*** Google. This is just fear mongering. Love the this tool guys! It would be super helpful if we could copy the url at the top. Other than that epic! Any way to change the user agent, or use a proxy? E.g. some more hidden sites will redirect me back to another page, or block me from viewing depending on IP.